I suppose, looking back, my writing has never been easy to pigeonhole. I’ve always had a habit of bending things out of shape. My Newbury & Hobbes novels are essentially mystery stories, focused on a duo of investigators, but they take place in a skewed version of history, in which Queen Victoria lived on to rule over an extended Empire filled with monstrous creations, weird technologies and occult goings-on. My Tales of the Ghost take place in a fantastical version of 1920s New York City, and even my first Sherlock Holmes novel features iron golems loose on the streets of London. Now, with Wychwood, I’ve written what’s essentially a contemporary crime novel with a supernatural twist. It seems I’m forever destined to blur genre boundaries. Or perhaps I’m just wilful! This ‘genre-blending’ doesn’t stem from any particular, innate desire to write a ‘mash-up’, but more a need to write what I’m interested in, and to allow my varied influences and passions to bleed through onto the page. With Wychwood, I’d always intended to write a crime novel with extra ‘spooky stuff’. To me, it felt like the perfect blend. I’m a huge fan of Sunday night crime drama on British TV – Midsomer Murders, Endeavour, Vera and more recently Strike, and I think my initial impulse came from wanting to work in that wheelhouse, but to give it my own spin, and bring some ‘low fantasy’, or supernatural elements, to proceedings. It wasn’t until I started work on the first draft that the whole Carrion King myth started to come to life, however, and soon I found myself concocting a whole fictional mythology with a rather dark, folklorish bent. Nevertheless, I was adamant that I wanted the setting to remain in the present day, and to maintain the mode of a traditional crime novel. I think the challenge with this kind of blending of genres is in sustaining a sense of realism, or at least ensuring that the reader is able to suspend their disbelief. You want them to be carried along by the characters and the story, and not pulled out of the narrative by things that seem jarring or too out of place. That’s a lesson I’ve learned before, with previous books. Get it wrong, and the reader feels as though you’ve pulled the rug from beneath them. It’s a harsh and valuable lesson. So, for me, the big thing is aiming for the right balance. Go too far in either direction, and the book becomes neither beast nor fowl. 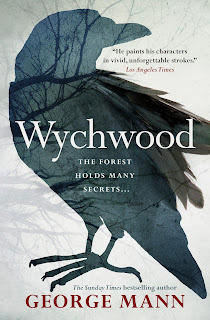 With Wychwood I learned early on that it needed to follow the structure of a traditional crime novel in order for it to work – keying in to that familiar language and form – but that I also had to be explicit about the supernatural elements, too. In my first draft they were far too subtle, and therefore ultimately unsatisfying. During rewrites, I strengthened those elements considerably, and for me, that feels like the breakthrough moment, the point at which it all began to work. I’ve had a similar breakthrough recently in the plotting of book two. It wasn’t until I realised how I wanted to approach the more fantastical elements that the story properly unlocked. Nothing is more rewarding than when it all clicks into place, though, and you’re able to navigate your way through the story. It’s at that point you start to see the shape of the whole thing, and realise that it’s all going to work. For me, that’s what writing is all about – finding those moments of joy amongst all the hard work!